The threat posed by Shiv Sena is growing into a "monster" that may prove very hard to control, a leading Pakistani daily said today and asked the Indian government to take action against the party to safeguard the country's image. 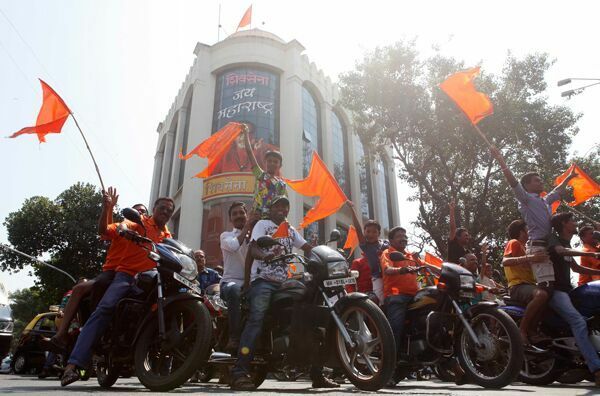 "It is obvious the Shiv Sena terror is getting out of hand. There have been repeated incidents over the past few months. Yes, the party has existed in the past and raised its ugly threats from time to time, but never with such force and venom," an editorial 'Shiv Sena madness' in The News International said. The paper said that Shiv Sena is allied to the ruling BJP which is a huge factor in the lack of government response to its extremist acts. "The threat posed by the hard-line right wing Shiv Sena group seems to be growing into a monster that may prove very hard to control," it said. The main thrust of the attack appears to be directed against anyone opposed to their extremist Hindu ideology; Pakistan and Pakistanis seem to be the main targets, the paper said. The editorial came after Shiv Sena activists stormed the headquarters of Board of Control for Cricket in India (BCCI) in Mumbai shortly before Indian cricket officials were scheduled to meet their Pakistani counterparts to discuss reviving cricket ties between the two nations. Later, the meeting was cancelled before Indian authorities mull over the option of shifting it to New Delhi. Shiv Sena also protested against Pakistani cricket umpire Aleem Dar for officiating in ODI matches of the ongoing India-South Africa series in India. "For the sake of India, its image and the region, New Delhi needs to act. Already, we see a huge gap opening up as far as relations between Pakistan and India go," the editorial said. "It is hard to see how these will be patched over at any time in the near future. Relations are now more fragile than has been the case for years and through the actions of the Shiv Sena, we see how much hatred exists for Pakistan in a country that has always held high its secular and democratic values," it said. Meanwhile, Khurshid Kasuri - Pakistan's former foreign minister whose book launch was opposed by Shiv Sena in Mumbai last week - has said yesterday only Prime Minister Narendra Modi could send back the 'Jinn of Hindutva' in the bottle he brought it out from. Earlier this month, threats from Shiv Sena led to organisers cancelling legendary Pakistani singer Ghulam Ali's show in Mumbai despite the ruling BJP assuring that the event would not be stopped.